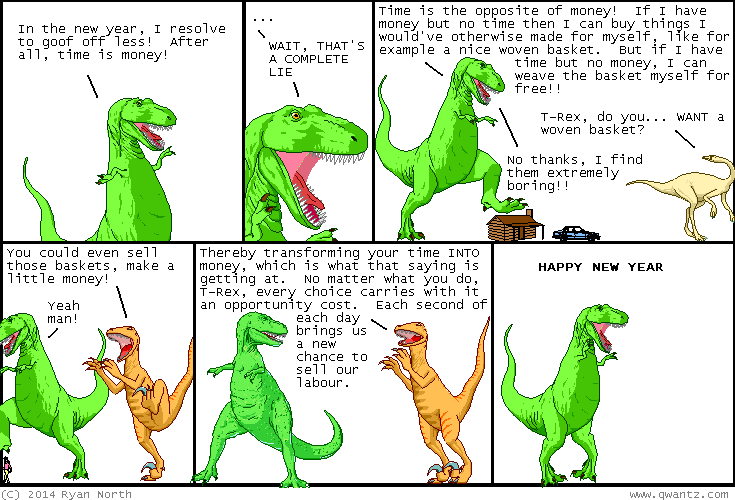 Dinosaur Comics - January 2nd, 2014 - awesome fun times! January 2nd, 2014: I hope you enjoyed the Klassic Komics (1, 2, 3). Today I got to change the little dates on my template (CONFESSION: I DO NOT DRAW EACH COMIC BY HAND, I'M SORRY TO HAVE MISLED YOU ALL FOR TEN YEARS): a rare pleasure! Every time I do it I think "wow this is insane; how is it I still get to do things like this?" Thank you all for reading my comic, for sharing it online, and for enjoying these crazy words I make the dinosaurs say. You let me have the best job in the world!